DARKENED ONE EVENING IN HONOR OF CHARLIE HEDBO, VICTIMS OF THE MASSACRE AT THE JEWISH MARKET AND AN ARAB POLICEMAN. THIS EVENING IN PARIS. BRIGHT LIGHTS OF LIBERTY. 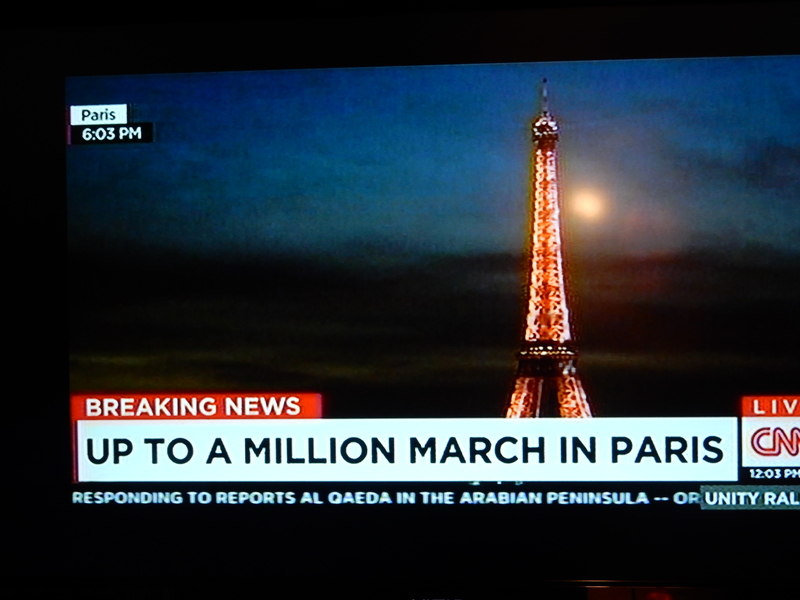 I’ve joined the march on Aljazeera and CNN. In Paris the chant is LIBERTÉ LIBERTÉ LIBERTÉ; there is some difference in sentiment between that and our ever ready chant of USA USA USA. I am thinking so many things. I would like to be there holding my pen in the air. Wandering the magnificent historic streets of Paris, stopping often for café au lait and du vin, the music of the language all around me. I love this place. The standard bearer of secular values. Of being free to mock pomposity and authority of any kind. Roaming around Damascus a few years ago. Friendly, pretty, relaxed city. Now no more. War is there. Can that happen to the streets of Paris? The US is absolutely linked with Israel in the minds of the Islamic world, as we should be except when Israel is wrong! Netanyahu and Abbas only a few linked arms apart today. What would be a real statement is if they had the guts to link their arms! That could make a huge difference in the world’s rhetoric of violence. I once visited the Field of Blackbirds where the Battle of Kosovo was fought between the Christians and the Muslims in 1389, a battle still being fought in former Yugoslavia, especially Bosnia Herzegovina, in the 1990s. Is this still that war? Endless conversation about Muslims being better integrated into French life. Yes. Both sides must work on that. If you immigrate to another country you should adapt to that country’s values. Period. And the country to which you’ve come needs to ensure you can access all of the friendship, benefits and customs of your new home that you desire. Period. My dad’s family came to the US during a time when, for immigrants, it was all about how quickly you could become Americanized. Consequently we were not urged to learn the language of the ‘old country.’ I am sorry about that because I love my Norwegian heritage but nevertheless there was no doubt that, for better or worse, we and all of the German, Irish and other European immigrants of the time became Americans. Shouldn’t the newcomers want to become real citizens of the country to which they have emigrated? And shouldn’t their adopted country welcome them wholeheartedly once they have been admitted? But then so many have not arrived willingly on any of the world’s shores; rather they’re fleeing death and destruction or in the too-often forgotten past, they arrived on slave ships…and that’s where it gets complicated. 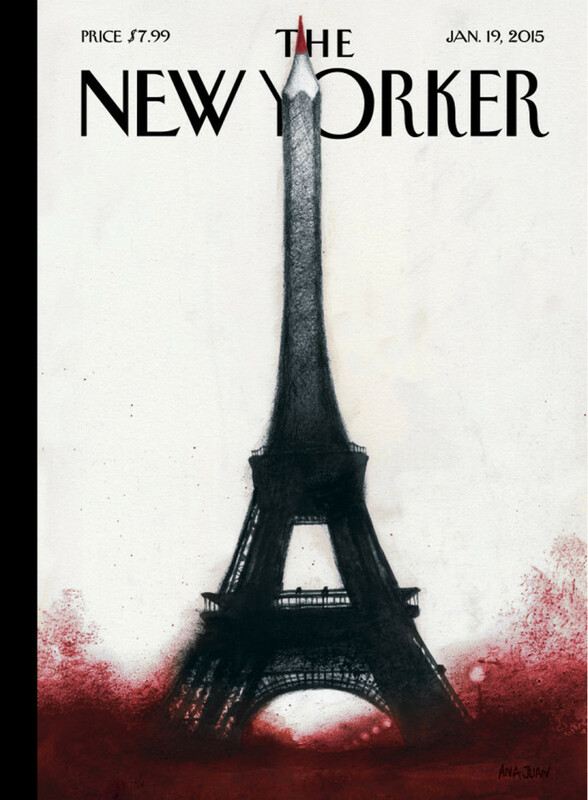 Someone says Paris today is a mood more of unity; US after 911 the mood was more warlike. Are moderate Muslims beginning to understand they must make themselves heard against the jihadists? Bernard Henri-Levy, French philosopher, says something is changing today. For the first time French Muslims are showing up in numbers as Frenchmen and women. He said today is also the return of self-esteem for France. He says France is a great country and that what happened today has happened NOwhere else in the world—this coming together of world leaders and such a strong representation of different religions and cultures. There is a sense all over the world that we have been too indulgent of jihadists. Stop we say. Stop considering them just a product of alienation but instead as the purveyors of a new fascism. Today we gather to express ourselves against this new fascism. Weakness is over. (I paraphrase Henri-Levy of course) Is he right? He makes sense doesn’t he? 43 Chiefs of State here. Where exactly is my President today? Golf date? Early evening in Paris. Good luck to us all. Can I just say JE SUIS FRANÇAIS. At the very least I expected my fellow Delawarean Joe Biden to be there…how disappointing. Yes, you know who is playing golf. We have for too long failed to realize that these fanatics are really new Nazis and would kill us all if we do not “believe” as they do. conform or die. Something wrong with that message. A Police Commissioner with SRPJ (Service Régional de Police Judiciaire), Helric Fredou, was found dead in his office early Thursday. It is being reported that he took his own life with his service weapon. Fredou was the 2nd highest ranking official in the department and was involved in the early investigations into the Charlie Hebdo massacre. French media claims that he interviewed one of the families of the victims and had yet to finish his report. A union representative has stated that Fredou was battling depression and experiencing burn out. He was 45.